Copyright: © 2017 Warren AM, et al. This is an open access article distributed under the Creative Commons Attribution License, which permits unrestricted use, distribution, and reproduction in any medium, provided the original work is properly cited. Background:While recognition and documentation of true drug allergy is critically important, most physicians acknowledge that its prevalence is likely overestimated, often on the basis of historical, sometimes anecdotal evidence. Correct or not, once applied, drug allergy labels may result in altered, potentially inferior therapy, increased costs and prolonged hospitalisation. Objective:Estimate the point prevalence, accuracy and symptomatology of self-reported drug allergy in a typical, large NHS Acute Trust adult inpatient population. In the subset with penicillin allergy (PA), estimate additional management costs from the use of alternative antibiotics and readmission rates in the previous 5 years. Methods:Data on self-reported drug allergies were extracted from 440 adult inpatient prescription charts over a 4 month period. Where penicillin allergy (PA) was reported, alternative antibiotic regimens were recorded and their additional costs calculated. Hospital electronic records were used to assess readmission rates of PA patients. Results:194/440 inpatients (44.5%) reported at least one drug allergy. 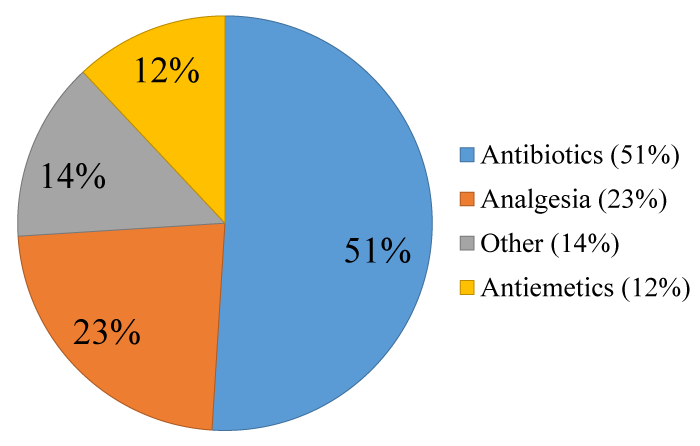 Antibiotic allergy was most commonly reported (51%), followed by analgesic (23%) and antiemetic (12%) allergy. PA accounted for 76% of reported antibiotic allergy. The commonest reported symptoms were cutaneous (42%) and gastrointestinal (18%). Where antibiotic therapy was required for patients with PA to manage acute infections, Ciprofloxacin, Clarithromycin, Teicoplanin, Clindamycin and Cefuroxime were the most commonly employed alternatives. Extrapolation of these figures to include the entire Trust inpatient population suggested that the use of alternative antibiotics in PA patients incurred additional annual expenditure of £268,000. Further, 87% of PA patients had been admitted more than once in the preceding 5 years, with 74% requiring further courses of antibiotics during these admissions. Conclusion:Self-reported drug allergy, and in particular PA, is common in hospital inpatient populations and, in addition to the potentially unnecessary hazards to individual patients resulting from the use of alternative antibiotics, results in a considerable additional financial burden to the healthcare system. This problem could be eliminated by the provision of a nationwide and equitable tertiary Allergy service. Drug allergy (DA) and its adverse effects have been well studied in humans [1-8], despite this an accurate assessment of the prevalence and incidence of true drug allergy remains unknown, due in part to the challenges of the resource intense testing procedures . Despite this uncertainty, it is clear that the true prevalence is likely to be much lower than that reported by patients . In routine clinical practice, and especially when compiling medical records, distinction of the authenticity of adverse drug reactions (ADRs) is of little practical importance; it is assumed that all drugs listed in the Drug Allergy section of a prescription chart are drugs that the patient’s doctors and pharmacists believe may have significant risk attached to them and are generally avoided. In contrast, this may be very problematic for the prescriber, particularly in cases of self-reported penicillin allergy (PA) in patients presenting with severe infections. Penicillin is narrow spectrum, well tolerated and inexpensive; consequently it is the most commonly prescribed antibiotic in secondary care . The problem of self-reported PA is compounded by the fact that in practice, it is typically extended to include all betalactam (BL) drugs because of their potential for cross reactivity . This is a serious concern as BL antibiotics are considered to be first-line empirical treatment for many life-threatening infections, such as bacterial meningitis , sepsis and septic shock , intra-abdominal infections , hospital-acquired, ventilator associated pneumonia , diabetic foot infections , and skin and soft tissue infections . The non-beta lactam (NBL) antibiotic therapy options that remain for patients labelled with PA include aminoglycosides, fluoroquinolones, tigecycline, or trimethoprim/sulphamethoxazole. Unfortunately, their use has been associated with higher treatment failure rates , more significant unwanted effects, a greater incidence of Clostridium difficile, methicillin-resistant Staphylococcus aureus, vancomycin-resistant Enterococcus species super-infections, antibiotic resistance [13,14] and longer lengths of stay compared with those without PA . The pharmacoeconomic impact of PA is also not insignificant. Picard and colleagues estimated that patients labelled as having PA carried an individual additional cost of more than $326 per patient per admission . In the UK, the cost of NBL antibiotics may be 1.82-2.58 fold higher than first-line antibiotics when used in patients with PA .
We designed a study to determine the point prevalence, symptomatology and accuracy of self-reported DA in secondary care. We then focused on PA. We aimed to determine how many of our sample of patients were eligible for BL therapy as ‘first line’ treatment according to local and national guidelines, and how this treatment was modified by a label of PA. Finally, we estimated the incremental costs incurred through use of these alternative regimes during the current admission and thus the potential savings from ‘unlabelling’ these patients. We further examined the recurrent admission rates of these PA labelled patients to extrapolate potential savings over a 5-year period. We undertook a cross-sectional study of 440 prescription charts for adult patients admitted to the surgical and medical wards of a large NHS Acute Trust (1,093 inpatient beds) over a 4-month period between November 2014 and February 2015. Patients were questioned on admission using a standard proforma. The presence or absence of DA, the medications listed and the signs and symptoms of DA appearing in the ‘DA’ section of the prescription were recorded. Every DA listed in the prescription was confirmed with the patient. We enquired about the accuracy of the record with the patient and whether DA was confirmed by an allergist. Where PA was reported, alternative antibiotics used during the present admission were documented, if required. In order to estimate the cost implications of prescribing alternative antibiotics to patients with self-reported PA, we studied a subset of 27 patients with a range of diseases (community acquired pneumonia, hospital acquired pneumonia, sepsis of unknown origin, infective exacerbation of COPD, neutropaenia, abdominal sepsis, skin infection and osteomyelitis) in whom therapy with BL would be considered ‘first line’ according to local hospital guidelines, but required alternatives due to the documented PA (Table 1). Prices for each medicine were derived primarily from the Drug Tariff available at the time of the analysis. Where products were not listed in the Drug Tariff, list prices were derived from the British National Formulary (Table 2) [22,23]. This was the basic drug tariff and did not include additional costs of personnel and therapeutic monitoring required for some of the BL alternatives. We then compared these costs with the theoretical costs of administering BL antibiotic therapy as per local and national guidelines. For this we used the prices of standard intravenous therapy (Table 2), reasoning that this would most likely have been employed for these acute, severe systemic infections. The differences between the costs were then summed to compute the additional daily cost. Costing analysis was conducted by 2 researchers independently. Table 1: cost of alternative antibiotics versus 1st line treatment for 8 common conditions with BL as 1st line treatment. *only includes PA patients who suffered from a condition for which a beta-lactam antibiotic was 1st line treatment. **total daily cost of treating all patients with the specific condition according to 1st line antibiotic regime (IV costs used to provide conservative price difference). Ù Total daily cost of alternative antibiotic regime prescribed in the trust if treating all patients with the specific condition. ÙÙ Difference between total daily costs of preferred regime (involving BL) subtracted from alternative antibiotic total daily costs. ^ Calculation= (actual daily cost per pt/total cost 1st line per pt). Table 2: cost of antibiotics used for calculations [22,23]. The hospital’s Electronic Record System was used to review the numbers of previous admissions in the preceding 2 and 5 year periods prior to the index period for patients with self-reported PA. The electronic ‘Discharge Summary’ was used to assess how many of these admissions required antibiotics and what antibiotic alternatives were used. A total of 440 inpatient prescription charts were reviewed. 194 (44.5%) of the inpatients, of whom 141 were female, had at least one DA recorded in the DA prescription box of their chart while 16% reported two or more. Only 2 patients had been investigated for drug allergy in an allergy clinic. Their DA diagnoses were confirmed through skin testing and challenges. Drug prescription charts reviewed were generally accurate (99%): one patient reported additional DA to omeprazole that had not been documented, while another denied documented clarithromycin allergy. Antibiotic allergy was the commonest self-reported DA, accounting for 51% of the total reported, while PA accounted for 17.5% (n=77) of the total reports and 76% of the antibiotic allergy reports. Analgesic and anti-emetic allergy accounted for a further 23% and 12% of the total reports respectively (Figure 1). 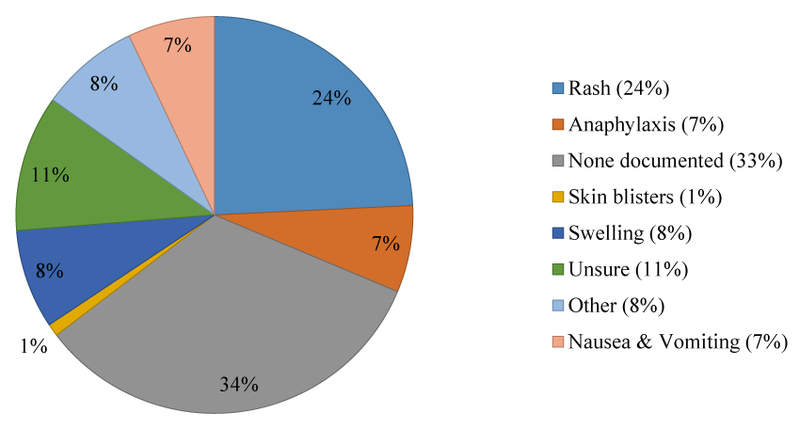 Reported manifestations of DA reactions were cutaneous (41%), gastrointestinal (19%), neurological (10%), respiratory (4%) and other miscellaneous (6%). Ten percent of reports were of systemic anaphylaxis. A further 10% were considered non-immunologically mediated (e.g. gastrointestinal bleeds with NSAIDs). Self-reported DA was commoner in older patients, with 69% of the total reported by patients aged >55 years. Figure 1: Classes of Drugs Causing Allergies. The range of self-reported symptoms of the patients with PA is shown in figure 2. Interestingly, 44% of these patients were uncertain or ignorant of the drug-induced symptoms which had resulted in their being labelled as having PA. Figure 2: Drug reactions as reported by penicillin allergic patients. Of the 77 self-reported PA patients in our cross-sectional survey, 36 (47%) required antibiotic therapy during the current (index) admission, while for 27 patients (35%) we judged that therapy with BL antibiotics would have been considered ‘first line’ therapy according to national and local guidelines. For such patients, Ciprofloxacin (16%) was the most commonly used alternative, followed by Clarithromycin (11%), Teicoplanin (8%) and Clindamycin (5%). Cephalosporins were generally avoided in patients with a PA label and used in only in 6.35% (Cefuroxime 5% and Ceftriaxone 1.35%). Cost calculations suggested an additional daily absolute local pharmacy tariff of £296.31 for the 27 patients (6.1% of the study population) who were labelled with PA and who would otherwise have been treated with BL as ‘first line’ therapy as per guidelines (Tables 1 and 2). If this is extrapolated theoretically to include the total inpatient population of the Trust (1093 patients, assuming that all beds are occupied), the additional estimated cost of alternative antibiotics for this hospital alone is £734.26 per day, £22,334 per month and £268,000 per year. A review of the historical electronic records of patients with a self-reported, documented penicillin allergy revealed that 73% and 87% of PA patients identified during the study were admitted more than once in the preceding 2 and 5 year periods, equating to 332 and 465 total readmissions respectively. Seventy-four percent of the PA patients required antibiotics at least once during their readmissions (Table 3). Again, Ciprofloxacin was the most commonly used antibiotic (14%), followed by Clarithromycin (13%), Teicoplanin (7%), Clindamycin (5%), Doxycycline (5%) and Cefuroxime (5%). We were unable to establish from electronic records the type of antibiotic used in 11% of the cases. Table 3: Admission rates for penicillin allergic patients. Self-reported DA was a common finding amongst our medical and surgical adult inpatients. We found that staggeringly 44.5% reported being allergic to at least one medication [24,25]. Although there appears to be a surprising paucity of studies on this subject matter, others have reported it to be in the range of 7% to 39% [24-26]. The discrepancy between our results and others may be related to the fact that up to 25% of drug reactions although reported by the patients, remain unrecorded in prescription charts and medical records . The prevalence of reported PA has been estimated at 8%-16% [28-32]. Of the inpatient population studied here, 17.5% had a PA recorded in their drug chart. While failing to ascertain, document and act on drug allergies may be a threat to the health care of individual patients, so may the false assumption that they exist. DA diagnosis is difficult to establish based on clinical history alone [33,34], hence most patients with a label of DA would not ordinarily receive that drug again. This underlines the essential role of formal allergy diagnosis in an allergy clinic; to confirm and characterize DA when it exists and to eliminate the label when it does not. This is particularly pertinent in the case of PA, as penicillin/BL substitution may result in poorer clinical efficacy and potentially serious unwanted effects, such as colonisation with Clostridium difficile and promotion of antibiotic resistance [9,19,24,25]. Furthermore, following assessment by an allergist, 80-90% of patients with a label of PA are demonstrated to be able to tolerate penicillins . Penicillin skin testing is safe and its negative predictive value is high. In large-scale studies, only 1-3% of patients with negative skin test responses had mild and self-limiting reactions on being challenged with the drug . It is of course not without a cost, however, Macy and Contreras estimated that the cost of extended inpatient stay alone is 9.5 times as much as penicillin allergy testing would cost . When prescribing antibiotics physicians’ choice is based on several factors: underlying condition, local and national guidelines, personal experience, antibiotic sensitivity; antibiotic allergy is only one of the factors consider. In the present study, BL antibiotics were the standard of care for 36% of patients labelled with PA, while quinolones, macrolides, glycopeptide and lincosamide antibiotics are the most commonly prescribed alternative antibiotic classes in those with presumed PA. This is in keeping with other studies demonstrating that quinolones, carbapenems and clindamycin are usually employed instead of penicillin [36,37]. Our ‘snapshot’, cross-sectional data suggests that the approximate additional cost of treating penicillin allergic patients in this typical, acute Trust is £268,000 per year. This is likely a minimum estimate, as this figure does not take into account the possible costs of treating unwanted effects of NBL antibiotics or cost of therapeutic drug monitoring required for several NBLs. Actual drug costs are, however, arguably only the tip of the iceberg. The mean duration of hospital admission for patients labelled with PA has been reported as 0.6 days longer than for control subjects . Macy and Contreras estimated $64.6 million saving over a 3-year study period by virtue of shortening the hospital stay . The problem is compounded with each readmission requiring antibiotics. A significant proportion of hospital inpatients suffer from chronic conditions and require one or more admissions in any calendar year. Remarkably, in our present study 87% of PA patients had at least one other admission in the previous 5 years and antibiotic treatment was required at least once for over 74% of these, suggesting that overall costs over time for PA patients are much greater. All of this data appears to underline the need for a concerted, global approach to the management of DA. It seems likely that the costs of providing a comprehensive allergy service would be more than offset by savings accrued through cheaper drugs and shorter hospital stays, especially given the readmission rates of most of our PA patients. It seems inexplicable, therefore, that Allergy as a specialty, and in spite of the previous Parliamentary inquiry, remains “the unmet need” within the NHS . Lack of allergy specialists is a global problem: 66% of Canadian physicians believe that shortage of allergists is a barrier to effective assessment of DA . Only 1% of our inpatients with self-reported DA were reviewed by an allergist. Picard and colleagues made a good case for having allergist on staff in every Canadian teaching hospital . Canada has similar number of physicians per capita to the UK (2.6 vs 2.8 per 1000 people) . There are 188 allergists and 35 allergy trainees, serving the population of 35 million Canadians . In the UK, there are 35 Allergy consultants and 8 allergy trainees serving the population of 65 million. An allergist in most, if not every tertiary referral centre, would begin to address the unmet need in the specialty. However, considering that there are 154 acute trusts, it is clear that at present and in the foreseeable future this remains unachievable. DA will continue to be a relevant issue for medical practitioners. We are using more medications including biologicals, which are immunogenic by design, and we are living longer, giving individuals more time to acquire more ADRs. We therefore need specialists who can competently deal with this problem. In spite of austerity measures and budgetary cuts, we should invest in allergy, an investment that is likely to bring quick and irrefutable dividends. Vander Stichele RH, Elseviers MM, Ferech M, Blot S, Goossens H. Hospital consumption of antibiotics in 15 European counties: results of the ESAC Retrospective Data Collection (1997-2002). J Antimicrob Chemother. 2006; 58: 159-167. Joint Task Force on Practice Parameters, American Academy of Alergy, Asthma and Immunology, American College of Allergy, Asthma and Immunology, Joint Council of Allergy, Asthma and Immunology. Drug allergy: an updated practice parameter. Ann Allergy Asthma Immunol. 2010; 105: 259-273.